The Adrenaline Mandate: Scorpion Leather Jacket & Pants for the Track! 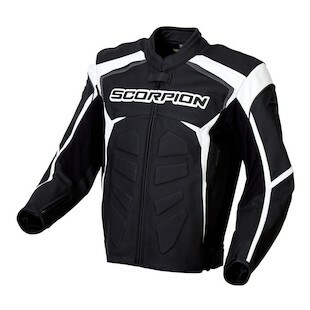 Sport riders rejoice, Scorpion is releasing a killer leather jacket and pant combo! We’ve seen several awesome sport leather jackets in the past like the Eternity, Stinger, and even the recently-released Assailant and have often wondered... where are the pants to go with it? This has been the missing piece to Scorpion’s puzzle. Well, the wait is over. And what better way to bring out an aggressive leather pant than with a complementing jacket? So we’ll start at the top and work our way down. The all-new Scorpion SJ2 Jacket is a no-holds-barred aggressive street or light-duty track-day jacket with 1.2-1.4m cowhide construction, reinforced double-stitched seams, and (wait for it) Sas-Tec elbow and shoulder armor (back pad upgradable)! Ventilation is achieved through custom perforated leather panels as well as zippered shoulder and back vents for some flow-through. The jacket leather is super supple and incorporates many accordion and stretch panels for added flexibility. So, in a nutshell: it’ll keep ya safe, it’ll keep ya cool, it’ll keep ya comfy, and it’ll give ya washboard abs without having to hit the gym. It’s win, freakin’ win, baby! Now that your torso is covered let’s talk about what hits below the belt-line. Finally, at long last, Scorpion has a track leather pant option... and we’re excited! 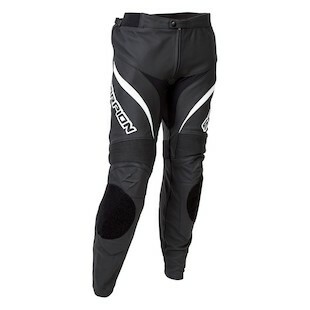 Made from the same materials as the SJ2 jacket, the Scorpion SP2 Pants give you everything you need to hit the track, sans the knee sliders (seriously, Scorpion, can we talk about this?). It makes sense, though, since these are designed primarily as an aggressive street pant that can go to the track if you’re a “once-per-season” kind of racer. Scorpion will make sliders available separately, so get ‘em if ya need ‘em. Also for the track, the SP2’s have a 21” connection zipper that will mate to the SJ2 jacket. Get your adrenaline pumping (mandatory) and knees dragging (optional) with the SJ2/SP2 jacket and pant combo!